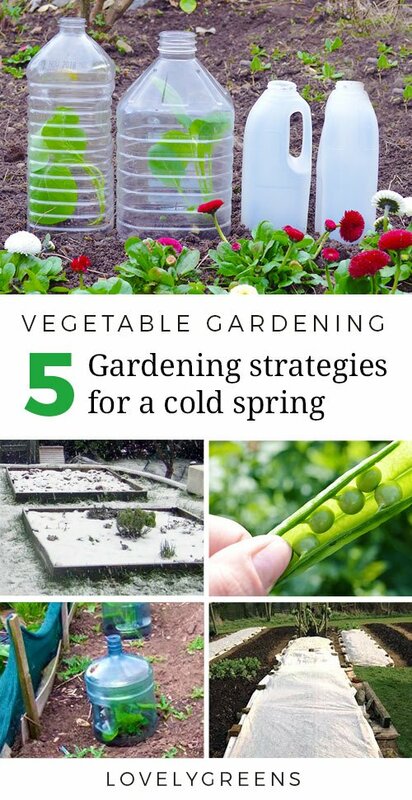 Vegetable gardening through a cold spring comes down to choosing the right varieties, growing under cover, and protecting young plants. Gardeners across the world are panicking — where on earth is spring? Peering at snow through window sills fast becoming seedling jungles is causing a lot of anxiety. I’ve heard lamentations of this being the coldest spring in living memory and worries about the summer to come. It reminds me of what happened seven years ago when folks were wringing their hands over the same thing. 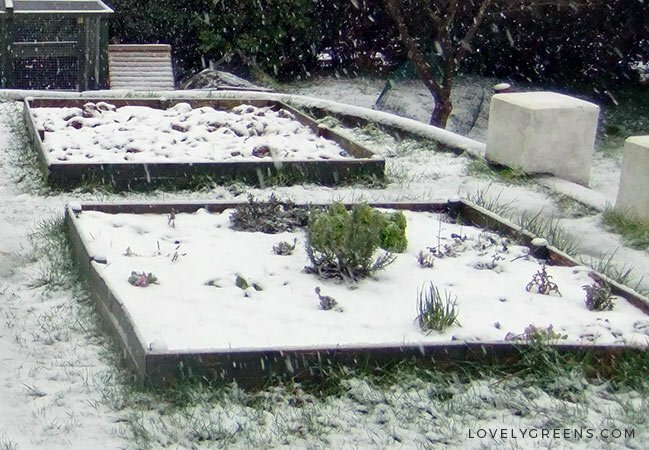 The photo above is my garden on March 28th 2011. That was a hard winter and the late spring was certainly a challenge. We have this idea that certain crops should be planted at this time and if it’s not possible, it’s the end of the world. Climate change or no, people who work with the soil need to be prepared for the unexpected. Late springs, hot summers, too much or too little rain. Being a successful gardener in any climate comes down to is being flexible, inventive, and understanding what plants need. Many people use cold climate gardening as a way of extending the season. A lot of its principles can be used to jump start your garden during a cold spring as well. Just because the back of the seed packet says you can sow outdoors doesn’t mean that you should. The same seed packet instructions can end up in wildly different regions, from Maine to Florida or from the Orkney Islands to the Channel Islands. In a good year you need to stick to growing guides for your own region. In a cold one, you need to disregard the rules. 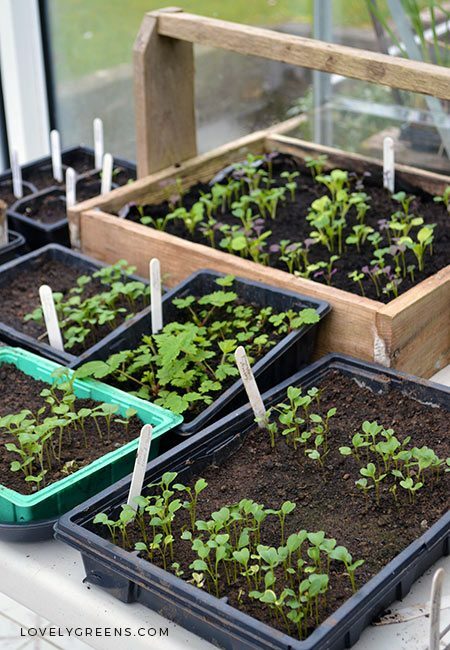 If your start to the growing year is cold or wet, it’s best to sow your seeds under cover. The best place to do it is indoors in a sunny window, in a warm greenhouse, or with the help of an electric propagator. Many seeds need to feel warmth to germinate so if you sow them in cold soil, they probably won’t grow. Another idea is to build a ‘Hot Bed’. If you have the space, build a container at least 3 feet wide, long, and deep. 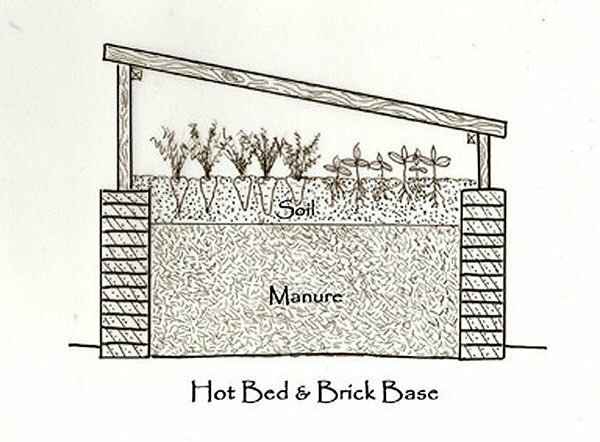 Fill it with a mixture of fresh and prepared horse manure and straw and then grow your seeds and plants in a layer of soil you add on the top. The heat from the rotting manure will warm the soil and lasts for up to two months. There’s a great diagram and instructions for building one on the Home Farmer website. With the exception of just a few veggies (carrots for one), most edible plants can be started off in trays and modules. Starting them inside and then moving them out when the weather improves will increase your chances of success. Last week I planted my first early potatoes but there are people at my same latitude that still have snow on the ground. 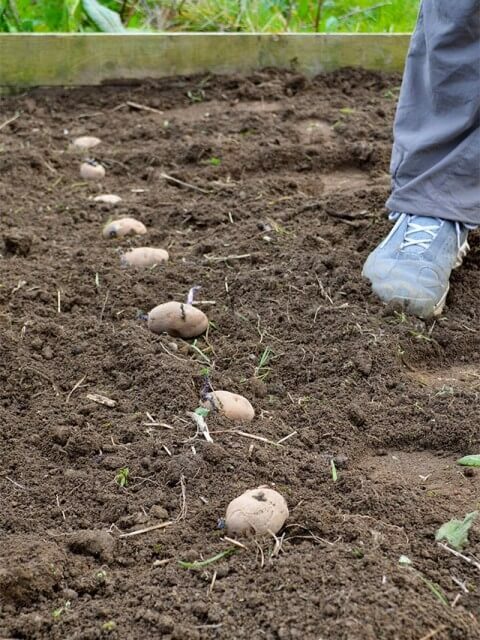 Planting potatoes in frozen or sodden soil isn’t a great idea, even if the tradition is to plant them on Good Friday. Making the call to wait just a little later can make all the difference. Plants have an incredible ability to catch up with the season. Sow seeds too early and they’ll be leggy and sickly when you take them outdoors. These sad little plants will produce less in the best-case scenario. In the worst, they simply die — a disheartening thing to see if you’ve been pampering them inside for weeks. If the spring has been cold and you’re waiting longer to sow, opt for quicker growing vegetables. 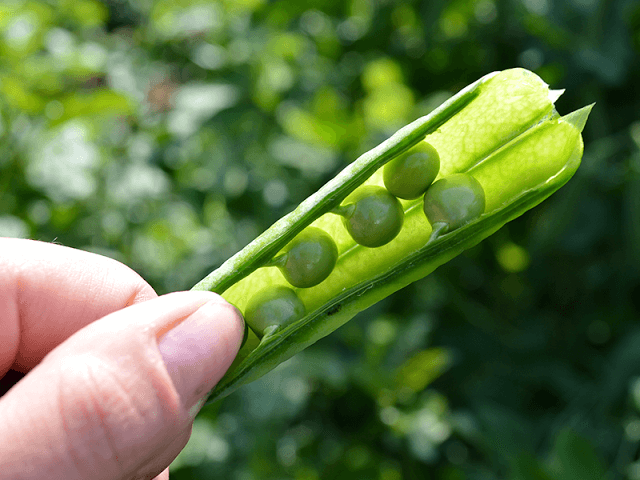 Smaller varieties, like dwarf peas, will produce pods a lot quicker than pea varieties that grow taller. This year I’m growing ‘Meteor’, a dwarf pea which only grows about 18″ tall. I’m also starting off a more traditional pea because I’m an optimistic gardener! There are countless cool-season and dwarf vegetable varieties to choose from so hedge your bets by growing some. Quick growing edibles like radishes, lettuce, and green salad leaves produce crops in 4-6 weeks. Grow them in an unheated greenhouse or sow them a little later and you’ll be rewarded in no time. It’s dead easy to grow cut-and-come-again greens at home and is a great idea for any time of the year, warm or cold. 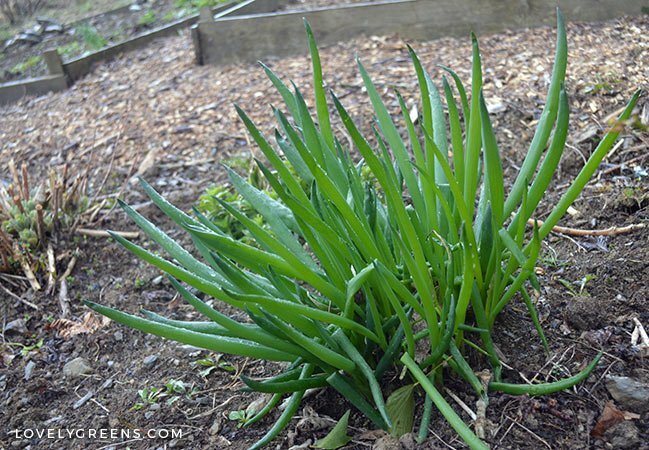 Another way to overcome a cold spring is to grow perennial vegetables. For this you really need to plan(t) ahead. Since that cold spring of 2011 I’ve been aware that you can’t always count on the seasons to nurture tender edibles. Perennials are planted once and are hardy enough to survive the winter and burst back into life in the spring — snow or no! One of my favourite perennials is the Welsh Onion and right now it’s pretty much the only green thing growing in the garden. It’s long leaves can be used as green onions or even as you would chopped chives. I sowed seeds for it years ago and it pops its head back up reliably every year. Other perennials aren’t ready until summer but with them you don’t have to worry about spring sowing. Some small plants can be planted out in cool to cold springs and will grow if given cover. Charles Dowding, an experienced British market gardener, doesn’t even harden off his lettuce plants before he plants them out. He says small plants establish themselves quicker than large and a layer of horticultural fleece keeps them protected from wind, rain, snow, and frost. Growing vegetables in fleece tunnels can protect plants but give them more room to grow. Cold frames and mini-greenhouses work on a smaller scale. Another way to protect young plants outdoors is to put a cloche over them. These can be glass and purchased from a specialist gardening supplier or plastic and made yourself. They work as mini greenhouses and keep the plant inside warm and protected. 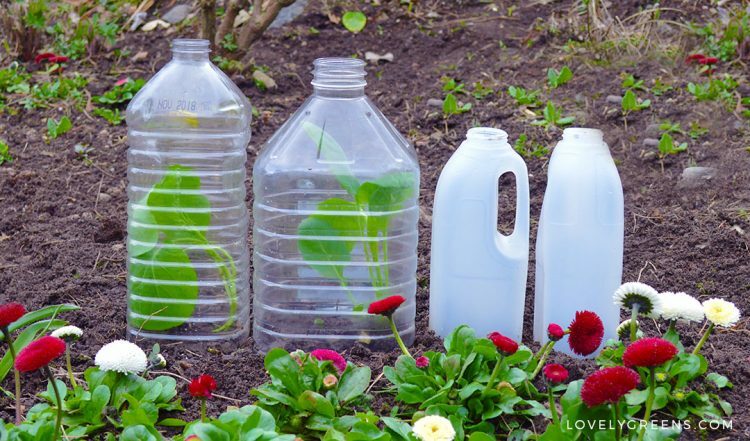 You can make your own cloches from plastic drinks bottles by cutting off the bottom and giving them a good clean. 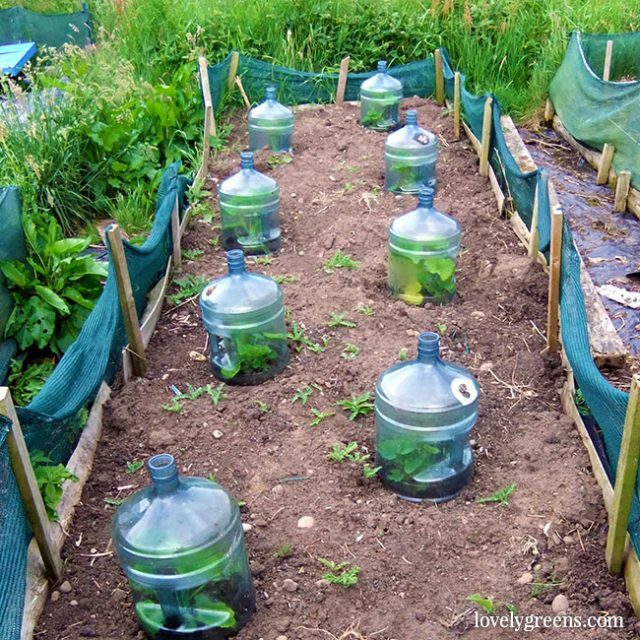 A bonus to using cloches is that they help keep slugs and snails from your plants as well. Just make sure that they’re well dug into the soil so that they don’t blow off. Your plants will suffer and plastic litter can become a real problem in the garden.